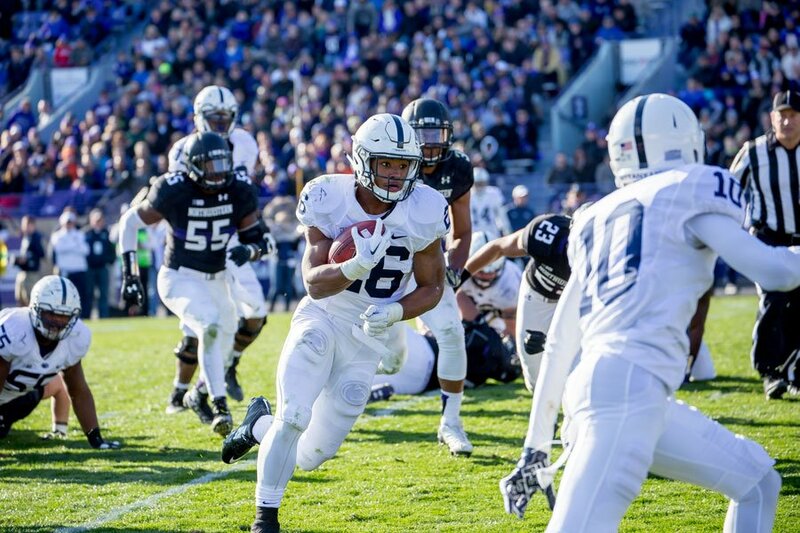 Penn State’s Saquon Barkley runs against Northwestern in 2015. The Heisman contender leads a potent Nittany Lions offense into Evanston. This weekend’s homecoming festivities might as well signify not only the return of thousands of alumni to Evanston but also the return of Penn State to the elite tier of college football. The Nittany Lions’ last, and only, time playing at Northwestern’s homecoming came in 2011, when they overcame a wild first half to down the Wildcats 34-24. Mere weeks later, first word of the Jerry Sandusky scandal broke, the Joe Paterno coaching era ended and the disdain of the sports universe cascaded down on State College. But now, behind the legs of Heisman frontrunner Saquon Barkley, the arm of quarterback Trace McSorley and the mind of coach James Franklin, the undefeated No. 4 Nittany Lions (5-0, 2-0 Big Ten) are staring down the mouth of back-to-back Rose Bowl appearances, at least. Evanston is just an inconvenient detour for this Penn State team, a chore to take care of before getting to their season’s critical stretch — games against No. 7 Michigan and No. 10 Ohio State the next two weekends. Fans migrating down Central Street on Saturday morning should not expect a similar contest to the one that transpired in 2011. While that Paterno squad ground out results with prototypical Big Ten physicality, the 2017 Nittany Lions unleash a dynamically athletic lineup on both sides of the ball and prefer to knock their foes out early. Through five games this year, Penn State has outscored opponents by a combined 73-0 margin in first quarters and outgained opponents by more than 180 yards per game. Last week against Indiana, Barkley returned a kickoff 98 yards for a touchdown, McSorley added two scores himself, and the defense, which has allowed 9.4 points per game, returned a fumble for a touchdown — all in the first quarter. Penn State eventually rolled to a 45-14 win. NU (2-2, 0-1) will probably meet a similar fate. Nittany Lions senior receiver DaeSean Hamilton and senior tight end Mike Gesicki, though the latter is questionable for Saturday’s game, are far more experienced than the Cats’ relatively raw pass-catching group. The same could be said for Penn State’s four-senior secondary, which has held opponents to a 53 percent completion rate. A pair of excellent interior defensive linemen — the barely distinguishable (by name) Curtis Cothran and Parker Cothren — will form a Justin Jackson blockade that NU’s offensive line, overwhelmed by Wisconsin last week, seems unlikely to break down. And McSorley could give the Cats, which have struggled in the past to defend mobile quarterbacks like Tommy Armstrong and Daniel Jones, fits with his scrambling ability. Dozens of NFL scouts and front office employees are expected at Ryan Field to see Barkley and McSorley. A national television audience will watch the two-headed monster’s escapades. The game will likely be, as most of Penn State’s Saturdays this fall have been, more an exhibition of dominance than a two-team matchup. Only then will the Nittany Lions be able to move on to the real main event, playing two straight games that could — and, if things continue as they have, will — cement their case alongside Alabama and Clemson as arguably the best team in the country. Only then will NU finally draw an equivalent opponent, heading to Maryland next weekend for a winnable contest. Saturday’s game might be entertaining, if only to see two of the nation’s most electric stars grace the decidedly not electric confines of NU’s 91-year-old abode. But it will not be competitive.